Chicanes slow vehicles by causing them to shift their horizontal path. They add opportunities for landscaping to improve street aesthetics. A chicane is a series of alternating mid-block curb extensions or islands that narrow the roadway and require vehicles to follow a curving, S-shaped path, discouraging speeding. Chicanes can also create new areas for landscaping and public space in the roadway. Chicanes are typically installed as part of a traffic calming project. On streets with space for parking on only one side, chicanes can be created by alternating parking from side to side. Chicanes can also be formed by alternating parallel parking and perpendicular parking. Curb extensions should be included at each end of on-street parking. 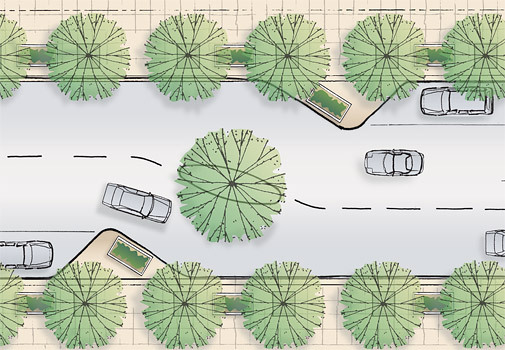 Where a wide right-of-way allows, parking may be maintained on both sides of the street through the entire chicane, and the entire roadway can jog from side to side using curb extensions. Chicanes in both conditions may include a median island at points of deﬂection to prevent speeding drivers from continuing straight down the center of the chicane, disregarding roadway markings. Chicane with parking alternating from side to side. Median islands and curb extensions (in chicanes as elsewhere) should include landscaping, seating, and stormwater facilities. Chicanes should not be located on streets with Rapid or Local lines per Muni’s operating framework. Though generally discouraged, chicanes may be implemented on streets with Community lines only; in these cases, the chicane should be located at a bus stop so that the impact on transit service and passenger comfort is minimized. Chicanes must maintain required clearances for emergency vehicle access, 14 feet on a one-way street and 20 feet on a two-way street. Among traﬃc calming measures, emergency vehicle operators typically prefer chicanes to speed humps, but the Fire Department has not expressed a formal preference. Chicanes should be designed to force vehicles to slow as they change course. Standard CA MUTCD formulas for calculating taper lengths for striping around a horizontal oﬀset caused by obstacles in the roadway typically yield tapers too long to achieve the desired slowing of vehicles. Accordingly, chicanes should be designed using formulas for lower speeds than are actually desired on the street. Where chicanes will added raised islands with curbs in the roadway, they should be reviewed by DPW Hydraulics to ensure that there is sufficient hydraulic capacity within the street cross-section. Stormwater features can help to oﬀset reduced capacity from raised islands as part of chicanes. See Traffic Calming Overview: Maintenance.